Bill Austin founded one of the largest hearing aid companies in the world. He worked incredibly hard to do that, but works even harder to give it all away. Over the years, Bill has worked with the likes of Elton John, Steve Martin, Muhammad Ali, Billy Crystal and Miley Cyrus, as well as hundreds of other celebs across the entire spectrum to bring the gift of hearing to the world. 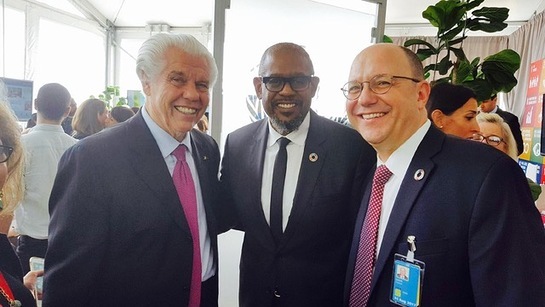 At a recent United Nations Generally Assembly meeting, Look To The Stars’s Ed Martin had the opportunity to talk with Bill about what drives him and why world leaders and celebrities like Forest Whitaker are drawn to give back alongside him. Below, Ed offers tips on how to lead the way in making a difference. I’ve known Bill for a number of years, and he does things differently. He works with everyone. Republican, Democrat, Palestinian, Israeli, rich, poor… doesn’t matter to him in his desire to want to show them love. He opens their ears, but also pours kindness into their soul. He knows what many have forgotten. Each person and their life is sacred and invaluable. 2) He understands that helping people to hear again brings many other things – a bigger sense of connectedness, an ability to better learn, the chance to be a bigger part of the broader society and it can offer a new purpose. In many parts of the world, people who cannot hear are shunned and pushed to the margins. Hearing again brings them back home. 3) It’s not inch deep with Bill Austin. He’s there 18 hours a day fitting children in conflict zones to extreme weather to all kinds of conditions… anyone that goes with Bill Austin on a hearing mission is not there for “watching”. President or celebrity, you are there to work with people. It’s because Bill wants others to feel what he feels. When you help someone to hear for the first time, and see their beautiful face and eyes light up, you feel the warmth of that light the rest of your life. And with the tremendous folks from UN partnerships and goodxchange.com, we began to see how bringing hearing to the world could transcend hearing and touch all 17 United nations Sustainable development goals. Imagine a child’s ears open, eyes widen and the spark of insight that the world around them is completely different than the moment earlier. There is hope, opportunity and compassion across boundaries. There is a way forward. In the meantime, thank you Bill and Tani Austin. And thank you to the incredible celebrity influencers who have used their platforms and heart to move this work forward.